New Jersey Gov. Chris Christie’s allies seemed to give a big old raspberry to presidential aspirant Mitt Romney on the front page of the New York Post today. Anonymous sources told the paper that Romney demanded Christie agree to resign the governorship if he was offered vice president on the GOP ticket. Christie was said to have declined since he didn’t think Romney would win. A spokesman for Christie said they were not commenting on the Post’s report and suggested contacting the Romney campaign, which did not respond to emailed questions. The possible need for Christie’s resignation arises from federal rules that forbid the employees of Wall Street firms from giving money to state officials running for federal office if the firms do business with that state. The rules affect firms that underwrite municipal bonds or advise state pension systems on their investments. 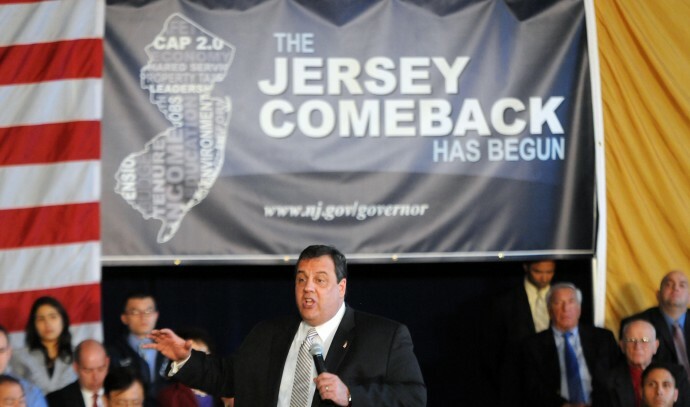 If the public official — in this case, the governor of New Jersey — has any influence, directly or indirectly, in selecting the pension investment advisers or bond underwriters, the firms can’t give campaign contributions. As governor of New Jersey, Christie, ultimately through a complicated process, appoints nine of the 16 members of the state investment council that chooses investment advisers. This would likely trigger the investment advisor rule and would have cut off an important spigot of campaign cash for Romney. This is the first presidential election where the state pension adviser rule, which was passed in 2010, is in effect. It has the potential to make it more difficult for sitting governors to run for federal office. The municipal bond rule, which operates similarly, has been in place since 1994. It posed a challenge in 2004 when Alaska Gov. Sarah Palin was selected by Sen. John McCain, R-Ariz., according to Ken Gross, an attorney with law firm Skadden, Arps, who advises firms on how to navigate the rules. Gross said that some companies were banned from doing bond business with Alaska for violating the provision. Under the rule, the ban lasts for two years. The pension investment adviser rule potentially covers many more firms and employees than the rule for bond underwriters. Louisiana Gov. Bobby Jindal, who was also rumored to be on Romney’s list of potential VP candidates, would also likely be covered under the rules. It’s not clear if a similar request was made of Jindal. We reached out to Jindal and will update this post when his spokesman responds. One governor who is frequently discussed as a presidential candidate in 2016 is New York’s Andrew Cuomo. Gov. Cuomo might expect to be a big recipient of campaign contributions from Wall Street since many investment firms are headquartered in his home state. But he would also not have to worry as much about the investment adviser rule, according to a spokesman. New York is what is called a “sole trustee” state. The state comptroller makes most investment decisions for the pension funds. But the governor still has appointing authority for many of the state entities that issue bonds such as the Metropolitan Transit Authority.